When people get involved in longboarding, it is usually for transportation purposes. Soon, though, the speed bug bites. It doesn’t get everyone, but it inevitably sends an intrepid few on a hunt for the best downhill longboard. Once a suitable stick is located, the sickness grows, and the infected will do whatever it takes to increase speed. Loaded Tesseract is the best board on my list. It’s a versatile PRO quality complete. But comes at a premium price. You can see it’s current price on Amazon.com here. If you’re on a lower budget, or perhaps a beginner, you might want to go with a cheaper option, such as a Sector 9 Lookout. It will be a decent entry board to downhill and general longboarding. You can find it on Amazon.com here. The flipside of that coin are the freeriders. Spinning and sliding at crazy speeds and drifting around hairpins, these riders are on the fringe — of both the sport and sanity. Of course, the two styles of downhill are not mutually exclusive. Riders can, and often do, change from one style to the other on the same run. Here are some of the best downhill longboard completes for either discipline, or for blending the two. 1.2 What’s NOT so Good? 2.2 What’s NOT so Good? 3.2 Whatš NOT so Good? 4.2 What’s NOT so Good? 5.2 What’s NOT so Good? 6.2 What’s NOT so Good? 7.2 What’s NOT so GOOD? 8.2 What’s NOT so Good? 9.2 What’s NOT so Good? The Rayne Darkside Vulture is 9.75-inch by 36-inch, top-mount downhill longboard complete with a slight radial drop, a rocker shape and a kicktail. It utilizes a vertically aligned bamboo core sandwiched between fiberglass outer layers. The fibers in the Triaxial fiberglass are laid in three directions, strengthening the deck. To get a better look, check out Rayne rider Levi Green prototyping the Darkside. With Road Rider trucks and 64mm, 80a Rayne Envy wheels, the Vulture is set up for freeriding, and will require different wheels at least to go top speed. The Mini Logo bearings are quality ingredients, but are not top-shelf bearings. Longboarders unsure if they want to ride downhill for slides or speed may consider the compromises in the Vulture’s equipment a benefit, though. Landyachtz’ Evo downhill longboard deck is eight plies of maple with deep concave and a unique drop-deck design. It is 39 inches long and 9.8 inches wide with a variable wheel base. The nose is wedged, while the tail is de-wedged, creating different angles. The front steers better, while the back is more stable, thanks to the differing angles of the trucks at the wedges. 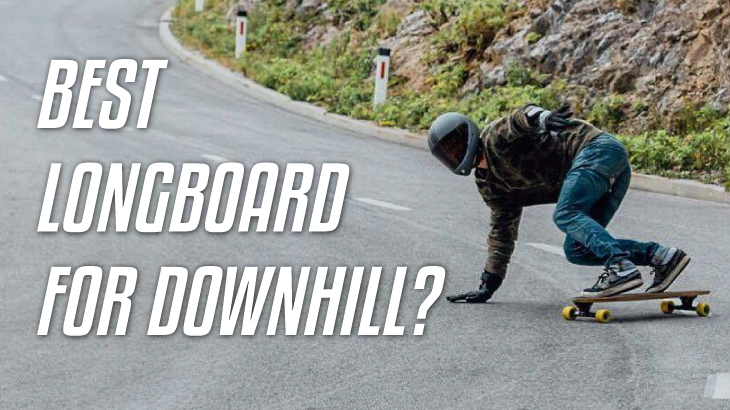 The result is a stable, stiff board — the perfect combination for downhill speed. The Evo comes with Bear Grizzly Gen 5 reverse-kingpin trucks and 76mm, 80a Landyachtz Monster Hawgs wheels. The only real complaint about the setup would be the Bear Space Balls ABEC-7 bearings, which are not the fastest bearings on the market. Not all downhill riders want a drop-deck this severe (feet below the trucks). The Brandy, from Sector 9’s Downhill Division, is 40 inches long and 10.2 inches wide and is fully dipped in paint. It has eight plies of cold-pressed maple for stiffness, with a deep, taco-mold concave. It is unidirectional with a short tail, and has large cutaway wheel wells to prevent wheel bite. Brandy decks have variable wheel bases — from 25 to 30 inches. The Brandy comes complete with silky and stable 10-inch Gullwing Charger II reverse-kingpin trucks, and the 72mm Sector 9 Speed Formula wheels have an 80a durometer. The bearings are PDP ABEC-5s, and tacky and coarse Jessup grip tapes keeps the feet planted. A bearing upgrade will improve speed, but the Brandy is fast enough for most riders right off the shelf. Atom’s 41-inch drop-through board is a great example of what a beginner’s longboard can be. Its maple laminate construction makes it stiff. The drop-through design provides stability but, with less downward force on the wheels, slides become easier. All of this means that the deck is great for beginners who want to get into downhill, either for pure speed or freeriding. The Atom downhill longboard deck is solid, but the trucks are truly lacking. With soft bushings, the trucks cannot be tightened to the point of stiffness. Firmer bushings smooth this issue, but a truck upgrade is the only real fix. The included ABEC-9 bearings are good but wear fast, but the wheels are more than functional. At 70mm and with a 51mm contact patch, they are fast and stable. The 44-inch deck on the Rayne Demonseed Gosha uses drop-through truck mounting, while also including a one-inch deck drop, resulting in an ultra-low center of gravity. It has deep concave and five-ply, bamboo and fiberglass construction. The wheelbase is variable from 33.5 inches to 34.5 inches. The Gunmetal trucks are sturdy, and they have 50-degree baseplate angles and reverse kingpins. The Rayne wheels are 70mm and 80a, with considerable lips to hinder sliding. Rayne Stoopid Fast bearings are designed to take the stresses of downhill, though there are faster bearings out there. Landyachtz’ Osteon Red Reaper uses nine plies of maple for stiffness, and has W-concave. It has a slight drop and equally slight rocker profile. At 9.8 inches wide and 38 inches long and with a minimalist kicktail, it is a great size for its freeriding purposes. The Reaper also has a variable wheel base (25 to 27 inches) and large cutaway wheel wells to accommodate larger wheels. At 9.8 inches wide and 38 inches long and with a minimalist kicktail, it is a great size for its freeriding purposes. The Reaper also has a variable wheel base (25 to 27 inches) and large cutaway wheel wells to accommodate larger wheels. The trucks on this complete are reverse-kingpin Bear Grizzly 852s, and the wheels are Landyachtz Hawgs. The Bear bearings are fast enough for cruising with the Osteon Red Reaper, but to maximize the downhill potential of the setup an upgrade will be necessary. Setup more for street freeriding. To maximize downhill potential, bigger wheels are a given. The Sector 9 Lookout II is a 5-ply bamboo, drop-through deck that is vertically laminated for strength. It is 42 inches long and 9.6 inches wide, and has a slightly cambered profile with mild concave. There is enough concave to keep a rider locked in, though, and the coarse, clear grip tape helps as well. The trucks on the Lookout II downhill longboard complete are Gullwing Chargers with 10-inch axles. The Chargers are Gullwing’s downhill carving trucks, and have 50-degree baseplates to suit the sliding, freeride downhill style. The 74mm Sector 9 Top Shelf wheels are a soft 78a. They are great for downhill carving, and they can handle higher speeds well. The PDP ABEC-5s are another story, though. They are decent, but an upgrade will increase the speed potential on steep hills. Loaded’s Tesseract is a symmetrical, twin-kicktail downhill longboard deck with copious W-concave and a rocker profile. It is 39 inches long and 9.5 inches wide, and has two outer layers of bamboo, sandwiched around a fiberglass core with a cork bottom that Loaded says dampens vibrations. The Tesseract has several truck mounting positions for tighter turns or more stability. There are large wheel flairs to prevent bite. For riders who freeride and also crave pure speed, the Tesseract is hard to beat. The Caliber trucks are 180mm wide with 50-degree baseplates. With an 86a durometer, the 70mm Orangatang Stimulus wheels kick out easily for drifting slides. This video on YouTube outlines the differences in durometer in the Stimulus, but the same goes for all wheels. Speedy Lunatic ABEC-7 bearings are fast and pure. Compensates for top-mount traction with hard wheels for freeride. A wheel swap is necessary for serious speedboarding. Arbor’s Highground is a 9-ply maple, unidirectional downhill board with W-concave construction that invites the tuck position. Typical for Arbors, the sustainably sourced maple is presented nicely on the deck’s bottom. The Highground is 35.5 inches wide and 9.5 inches wide with a stubby tail, and it is made with speed in mind. The reverse-kingpin, 43-degree Paris trucks have a loose turning radius to remain stable at ultrahigh speeds. The Arbor Summit wheels — 71mm, 70a — are offset and have a mid-angle lip with a soft side wall that acts as a leaf spring, adding rebound. The Summits power through fast turns, and they grip when you need them to, but they slide easily and smoothly on command. The ABEC-5 bearings are adequate, but faster options exist. As a unit, the Highground may be the best downhill complete for riders who like to switch disciplines on the fly. The best downhill completes start with a great deck. Stiffness is key — flex equals instability, and instability causes speed wobbles. Manufacturers typically use eight or more layers of maple, or various exotic materials, to achieve the required stiffness for high-speed stability. For very high speeds, shorter, directional boards reign because there is never a need for riding switch. Any slides are usually for braking purposes. The most street-oriented freeriders often opt for more of a twin-kick deck, while downhill freeriders often choose longer, drop-deck or drop-through boards for their ease of sliding. The amount of concave a downhill longboard deck should have is subjective. It should be present, though, as it locks the feet in for more control around fast corners and for pre-drifting. A mellow, W-concave is a common feature, but the taco shape is as well. Rocker profiles are another common feature, as they lower the rider and provide rigidity. For the fastest setups, stability dictates everything in the best downhill trucks. Baseplate angles get as low as 40 degrees to loosen turning radii, and the reverse-kingpin is the norm. Most modern racers are drifting toward top-mount decks because they apply downward pressure on the wheels for more traction. Drop-decks and drop-throughs lower the rider for a more stable ride, but the sideward pressure on the wheels makes them slide easier. The best downhill longboard wheels all have a few things in common as well. They are usually taller — necessitating large cutouts in top-mounts decks — and have wider contact patches for traction. The lip profile is usually sharp, and soft durometers (78a to 80a) increase exit speeds. Center-set cores offer more grip. For freeride, the opposite of all of that is true — harder compounds, rounded lips, thinner contact patches — all in the name of sliding. For these riders, offset cores provide more stability when breaking traction, and make hooking back up easier. Most riders who seek out hills evade marketing boxes and the labels manufacturers put on them. The majority will want a board that is stable when hitting blazing speeds, but that can also kick into a heelside slide when freeriding is in order. Some of the longboards on this list can please most everyone, others are either race or freeride boards. The more a longboarder veers toward one extreme or the other, the more likely it is that two distinct setups will be required to switch disciplines. In which case read our guide about the best longboard brands on the market.